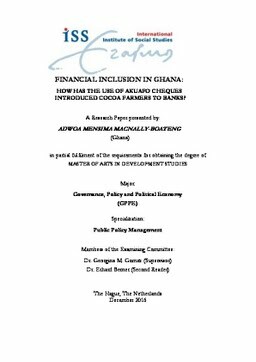 Erasmus University Thesis Repository: Financial inclusion in Ghana : How has the use of Akuafo cheques introduced cocoa farmers to banks? Financial inclusion in Ghana : How has the use of Akuafo cheques introduced cocoa farmers to banks? Financial inclusion is a developmental policy, which is increasingly gaining importance in many countries in the world because it can bring many welfare benefits. The World Bank estimates that globally about 2 billion working adults do not use formal financial services. It is to help address this phenomenon that the World Bank Group and a coalition of partners in 2015 made commitments to help promote financial inclusion, and accelerate universal financial access by the year 2020. Arguably, extending an individual’s access to finance is the first step towards building an enhanced standard of living. More importantly, financial inclusion is key in upgrading the living conditions of poor farmers and other vulnerable groups such as women and the youth. In Ghana, many more people live in rural areas than in cities. Thus, an increased growth of the rural market will ultimately lead to a growth in the national economy. It is for this reason that extending financial services and lending opportunities to rural households is essential. Literature on the importance of financial inclusion indicate that factors such as levels of income, inequality and literacy move closely with levels of human development. This study endeavours to bring to the fore the impact that the availability of basic or low cost bank accounts to cocoa farmers in rural areas of Ghana can have in promoting the use of banking services in particular, and financial inclusion in general. Thesis Advisor Gomez, Georgina M.